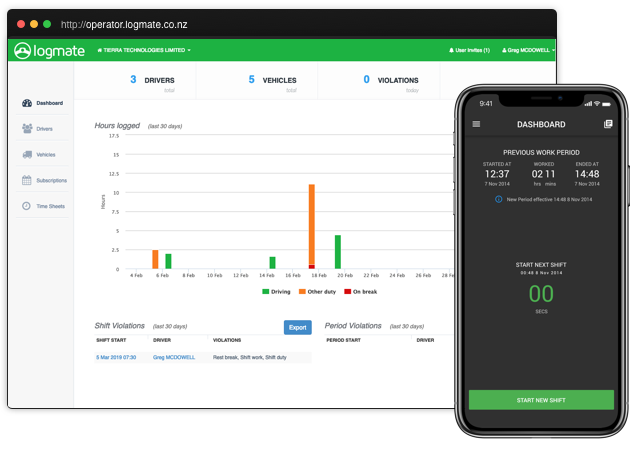 News Flash: Version 2.0 of Logmate is live as at 11:00 7 March 2019 - About time right! Say Good-bye to paper logbooks right now! It's a drivers work diary that's simple to use, helps remove the hassle and keeps you up to date. exactly how long to go in hours & minutes. Unique to Logmate, our Traffic light colour scheme means you know, at a glance, what your current status is. No squinting required. Intelligent Alarms give you a heads up when you need to Take a Break, End a Break, even when you need to End work for the day. All logbook data is stored safely in the cloud so you can access it when-ever and from where-ever. I got involved in the trialling of Logmate in early 2014. What impressed me from the start was how easy it made keeping my Logbook. A big plus was how much time it saved me every day and that I no longer had to worry about how many hours I had done or when my next break was due. I'm stoked that I'll never have to use paper again. I was fortunate enough to be involved in trialling Logmate. I found using Logmate to be extremely easy & intuitive. It just made sense. I particularly liked that it generated most of the details for me, which gave me more time to focus on my customers and business rather than paperwork. The automated reminders for break, etc were brilliant. No risk of forgetting. Logmate is definitely the way forward to improve compliance and road safety for all.